Pic courtesy of Jan O.
Hermanns tortoises are herbivores and in the wild consume a wide variety of flowers, leaves, and plant stalks. Their natural diet is high in fiber and calcium, and low in protein and fat. Preferred is Mediterranean oak forest, arid, rocky hillslopes with scrubby vegetation. Yugoslavia, Bulgaria, Bosnia, Croatia, Romania, Macedonia, Albania, Greece, Turkey, Hungary, southern Italy. If possible, a safe and secure outdoor habitat with plenty of sun is preferred, and it should be planted with a variety of edible weeds, wildflowers, and a little bermuda grass. A southern exposure for basking, and bushes and rocks for hiding will be greatly appreciated. If an indoor habitat is used, it should mimic an outdoor one as much as possible. Adults and even babies should be outdoors, if the enclosure is safe from predators, including birds. For an adult, about 6'x4' should be enough, but the bigger the better. If you house more than one hermanns tortoise together, the enclosure must be larger. Hermanns tortoises are active and will dig and climb, especially if their pen is too small. To prevent escapes, make sure the pen's walls are placed several inches below ground surface and either makes the walls high or place a lip along the top of the wall to discourage climbing. For a hatchling's indoor enclosure, a rubbermaid container filled with a mixture of organic soil, orchid bark, and play sand makes a nice habitat. Form some hills in the dirt, put in a few rocks, and place a seed tray in one corner to grow some sedum, weeds, and wildflowers. You can also accommodate an adult in a similar, but larger, rubbermaid container. Indoor enclosures need to have UVB light from a bulb, such as a Reptisun 5.0. You will also need a heat lamp for a basking area and a hide box for some privacy. Mercury vapor lamps, which supply heat and UVB, are good as long as the enclosure offers a warm end and a cooler end. Clean water should be available daily, and twice-weekly soaks are not a bad idea, either. Hermanns tortoises kept outdoors will often make a point of coming out during a rainstorm and drinking from puddles! The best diet is a natural one that allows the tortoise to graze on various weeds and greens. Such things as dandelion, bindweed, opuntia cactus, sedum, plantains (the weed, not the fruit known as plaintain), coreopsis, hibiscus, mulberry leaves, California poppy, mallow, honeysuckle, some vetches, some clovers, bermuda grass, and many other wildflowers and weeds can be grown in an outdoor tortoise pen. It is also possible to grow many wildflowers and weeds indoors and in greenhouses so that your tortoise does not have to rely on grocery store greens, especially in winter. Anything the tortoise might graze on must be pesticide free. If fed grocery store produce, it should be mixed into a salad and may include endive, escarole, shredded carrot, kale, opuntia, occasional romaine, and occasional pumpkin. The mixed salad diet is low in fiber so it is helpful to sprinkle with bermuda grass hay that has been ground to a powder (a coffee grinder works well). Dust the food with calcium daily, and if the tortoise isn't kept outdoors in natural sunlight, also use a combination calcium-D3 product a couple of times a week. It is also helpful to keep a cuttlebone (with the back removed) in the enclosure so your tortoise can nibble on it if she or he feels the need for more calcium. Foods to avoid (or to use in very *tiny* amounts) because they interfere with the uptake of calcium: spinach, broccoli, brussels sprouts, cabbage, beans, peas, cauliflower, collard greens, beet greens, turnip greens, mustard greens. 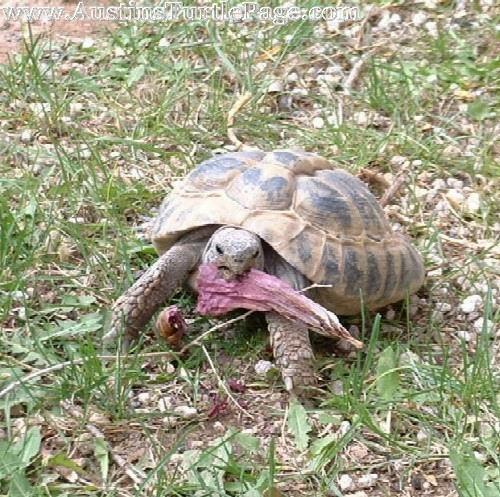 Fruit also should be avoided because the hermanns tortoise's digestive system can't process it. You should not mix tortoise species because of the danger of transmitting parasites and other organisms to which a hermanns tortoise might not have an immunity. It's not a good idea to mix hermanns tortoises of greatly different sizes because of the danger of injury to smaller ones. Do NOT house males together as they may fight. Females may be housed together, as well as a male and 2-3 females. Males are aggressive so keeping one male and one female together is not recommended, although it may work fine in some cases. Hermanns tortoises don’t get "lonely" so they don't necessarily need company..
Other Information: The Hermanns tortoise is a beautiful species of tortoise. They are very hardy, stay small, and are quite friendly. There are two subspecies, Western and eastern. The eastern hermanns (Testudo hermanni boettgeri) get a little bigger and are much more common than the Westerns (Testudo hermanni hermanni).